Split peas belong to the same family as lentils and beans. What distinguishes these dried peas is the ways in which they are prepared and how they are shaped. Dried peas are spherical and produced by harvesting the pea pods when they are mature and then drying them. After they are dried and the skins are removed, they split on their own. They come in green, red and yellow colors. Yellow split peas offer many nutritional benefits, including being rich in dietary fiber and protein. According to Legume World, as a legume split peas offer more dietary fiber than many major food groups and are a rich source of energizing complex carbohydrates. Split peas make a great addition to any dietary program. A 1/2-cup serving of cooked split peas provides 144 calories, 10 grams of protein, less than 1 gram of fat, 26 grams of carbohydrates, 10 grams of dietary fiber, 2 milligrams of sodium and 0 milligrams of cholesterol. Yellow split peas are a particularly excellent food source of B vitamins and several minerals essential for human health. Yellow split peas are rich in two of the energy-yielding nutrients: protein and carbohydrates, meeting on average 20 and 10 percent, respectively, of the recommended daily value or DV for a 2,000 calorie diet. Though split peas do not contain all of the essential amino acids necessary for human health, such as animal proteins, they are particularly rich in the amino acid tryptophan, meeting over 1/4 of your daily requirement in a 1/2-cup serving. Tryptophan is needed to manufacture the neurotransmitter or brain chemical serotonin, which regulates mood, appetite, hunger and sleep. 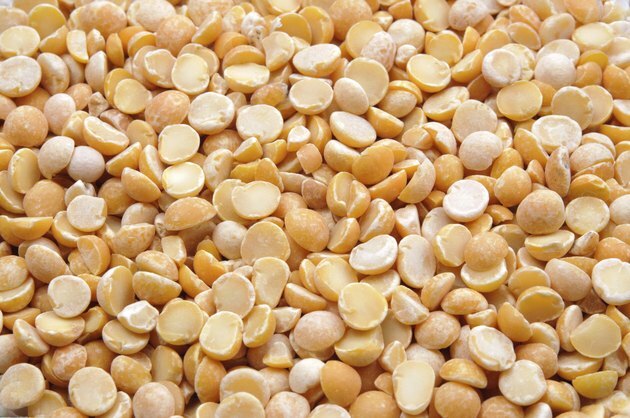 Yellow split peas are particularly rich in vitamin B-1 or thiamin, providing approximately 0.18 milligrams per 1/2-cup serving or 12 percent of the DV and 64 micrograms folate, or 16 percent of the DV. In addition to aiding in energy metabolism or converting the foods you eat into energy for your cells, thiamin is needed for proper nervous system function. Folate serves many functions, such as contributing to heart health, enhancing immune system function, preventing birth defects and forming red blood cells. Like beans, split peas are a mineral-dense food, according to the USDA National Nutrient Database. Split peas offer phosphorus and potassium, meeting about 10 percent of the DV for each per 1/2-cup serving. Phosphorus, along with calcium, is a major mineral involved in developing strong, healthy bones. It is also a component of all cells and DNA. Potassium helps regulate heartbeat and blood pressure and promotes healthy arterial circulation. Split peas are high in the trace minerals molybdenum and manganese, which are involved in metabolic reactions in the body. A 1/2-cup serving of cooked split peas offers 7 grams of insoluble fiber or "roughage" and 3 grams of soluble or viscous fiber. Both types are important for optimal health. Insoluble fiber promotes healthy digestion, softens stool and encourages regular bowel movements, while soluble fiber offers other benefits. According to Colorado State University Extension, soluble fiber aids in weight management by enhancing the feeling of "fullness," helps decrease blood cholesterol levels and stabilizes blood sugar levels.